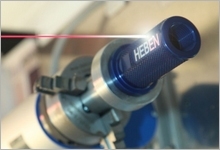 Ernst Wagener Hydraulikteile GmbH has brought a practical system for direct and permanent identification of hoses to the market: KENNFIXX ® – invented by Georg Rubenbauer from Upper Palatinate (Oberpfalz) and protected by copyright. Our solution simplifies work processes and eliminates sources of error in the modern agricultural engineering as well as in the construction industy. Furthermore it makes the coupling of hydraulic lines extremely user-friendly. Wherever hydraulic systems are applied and a huge number of hoses is employed KENNFIXX ® offers a brandnew way of guidance. This system revolutionizes the market – especially in regard to its application at the rear of modern large tractors. An intensive questioning of OEMs and practioners from industry, agriculture and construction industry had preceded the product development. Promptness, safety and user-friendliness were considered to be the most important aspects in daily dealing with hydraulic systems. For realisation Georg Rubenbauer took these parameters as a basis for the implementation. To these aspects the brandnew world first KENNFIXX ® makes an important contribution, especially for manfufacturers of attachments. 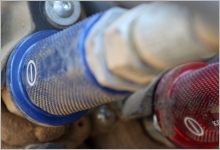 The non-slip marking grips are easily mounted into the hydraulic line in front of the hose end piece as premounted kit with ISO-A coupling or flatface coupling and screwing unit. The grips are made of anodized aluminium and available in up to 10 colours; a “plus”- or “minus”-symbol allows an additional differentiation between flow and return flow. On demand each KENNFIXX ® product can be marked permanently with texts and company logos. KENNFIXX ® enables even unexperienced staff to match any line fast and properly. This is a safety aspect that should not be underestimated. At the same time the product protects the extremely sensitive piece of tube in the zone of the lead connection or drain connection. 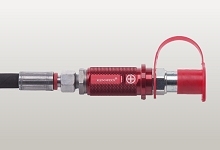 Each common hydraulic hose can be upgraded with KENNFIXX ®. The small diameter, a low weight and a high quality processing stand for modern requirements in regard to efficiency and durability. In the OEM market KENNFIXX ® is distributed exclusively by Ernst Wagener Hydraulikteile GmbH. This company has made a name for itself as a reliable partner for couplings and ball valves and also as a manufacturer of tailored made hydraulic hoses and hydraulic kits according to customers’ specifications. A huge number of service features and consulting service are always included at Wagener.